Microscopes and telescopes are amazing devices because they can “transport” us to other worlds at the speed of light. This is why we constantly scour Craigslist for vintage optical instruments. We like retro optical-tech as it is typically very well-made, (usually) still functional, and (some) can be had for pennies on the dollar. Of course, it helps to stick with well-known names like Zeiss, Leica, Nikon, and the like. However, every once in a while we happen upon a piece with a name we do not recognize, but has a deal so good that we cannot not pass it up. 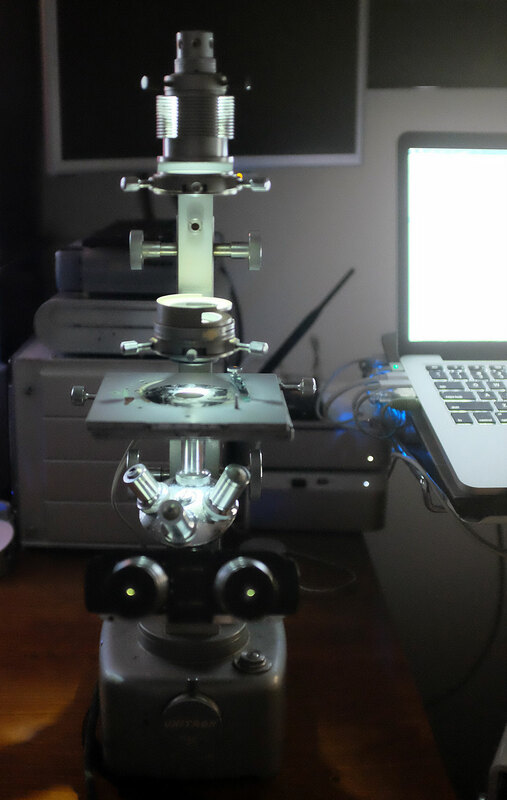 This was exactly the case with the Unitron MiC3-616 inverted biological microscope we scored a couple of weeks ago. This beauty was a little grimy when we got our hands on it. While in desperate need of a good cleaning (it, not us), the optics (eyepiece, objective lenses, condenser, etc) had no scratches, mold, or moisture-related issues. The mechanicals (gears, turret, knobs) were definitely a little stiff, but they all moved without any grinding…an excellent sign. Best of all, the electricals (lamp, switches, wiring, etc) were complete and functional, which is great because they can be a pain to repair and nearly impossible to replace. Some of the gray paint had been worn away from use, there was a layer of dust and dirt coating everything, but there wasn’t anything we could see that a bunch of Q-tips, some isopropyl alcohol, and a lot of patience could not fix. Components on vintage instruments are usually made of high-quality, machined, metal parts. The pieces on this Unitron microscope are no different. The knobs, switch, and button seem to be made from stainless steel. The stage (from the wear spot) looks to be made of brass. The base is heavy and is probably cast iron. In examining the scope, the one item we did not expect to find was an LED as the light source. There is also a button at the base which will temporarily increase the brightness of the output. The condenser on the scope is an interesting structure. It has is a slot for inserting what we would assume to be filters, and a lever for adjusting the iris to manage the amount of light coming out of the condenser. The stage has two screw knobs to slide the platform in both the X and Y directions. On the side and in the front are markers to show the relative position of the stage. On the platform is a slightly corroded repositionable slide clip. The objectives holder-turret underneath the stage can accommodate four lenses. It looks a little worse for wear, but as there is no flaking of the chrome, and it should clean up nicely. The four lenses will definitely need cleaning. The glass on the lenses has some surface grime. There are some rust spots and pitting on the metal covers and sleeve. We will see how much of it we can remove without risking damage to the optics. 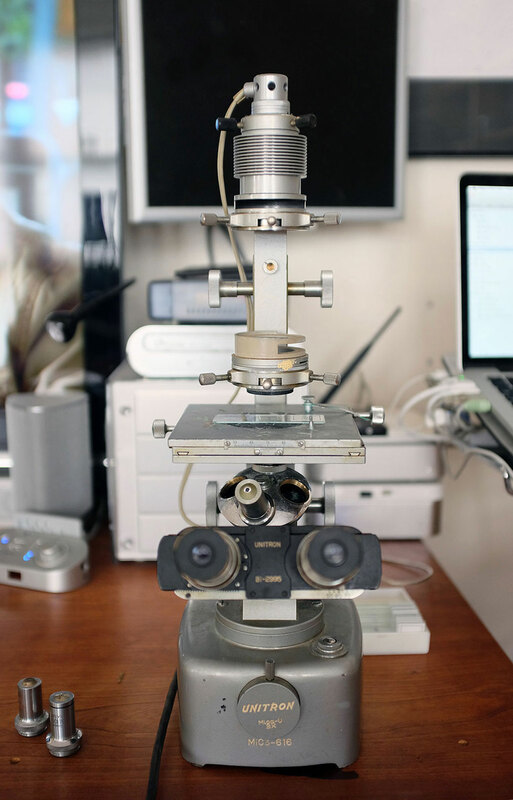 In researching this microscope, we learned that UNITRON started out as a family owned business in the early 1950s in Boston. The company earned its reputation as a manufacturer of high quality microscopes, cameras, telescopes, and binoculars. The business changed hands a few times over the years. At one time, it was even part of Nikon’s business. It went back into private control in the 1980s. Today, UNITRON, headquarted in Long Island NY, is still manufacturing a complete line of stereo, metallurgical and material science microscopes, as well as LED lights, digital microscopy cameras, telescopes, and binoculars. Over the course of the next few weeks, we will be cleaning and restoring this fine instrument to full operational status. We will be posting updates of our efforts. Also, we will be pairing this Unitron microscope with our EXO Focus camera and see what we can discover with the combo. Look for those write-ups later this Summer as we explore the microscope world.